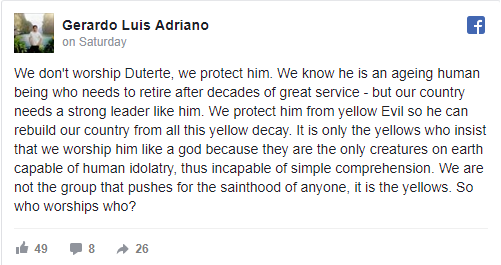 PRO DUTERTE SAID: "WE DON'T WORSHIP DUTERTE, WE PROTECT HIM FROM YELLOW EVIL." A vocal supporter of President Rodrigo Roa Duterte stated that what he and his fellow supporters are doing are just trying to offer protection to the President, whom he said is being targeted by his enemies despite the fact that he is now aging. “We don’t worship Duterte, we protect him. We know he is an aging human being who needs to retire after decades of great service – but our country needs a strong leader like him,” Gerardo Adriano said. He claimed that the “yellows” or the Liberal Party which was popularly branded as Duterte’s opposition, are the people whom they are protecting the Chief Executive against. “We protect him from yellow Evil so he can rebuild our country from all this yellow decay,” he said. “It is only the yellows who insist that we worship him like a god because they are the only creatures on earth capable of human idolatry, thus incapable of simple comprehension. We are not the group that pushes for the sainthood of anyone, it is the yellows. So who worships who?” he added. Since he sat in position, Duterte has faced rumors that he is facing ailments. The President in June answered such rumors after disappearing out of the public eye for five days. “Do not worry. There is a Vice President who will take over. My state of health is immaterial,” Duterte said in an interview with reporters in Butuan City on Saturday, June 17. The Constitution, under Article 7, Section XII, specifies that in case of serious illness of the President, the public shall be informed of the state of his health. Supporters of Duterte clarified that his ailments are just minor.